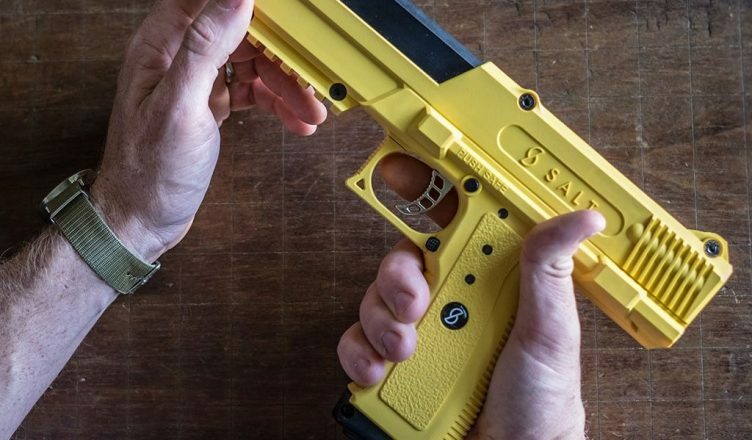 A start-up company called Salt Supply has created SALT – a non-lethal gun made for self-defense. Instead of gunpowder-powered ammunition, SALT has bullets infused with a chemical powder which explodes upon impact. The compound contains similar components to that of a pepper spray and tears gas, causing temporary blindness, skin irritation, and breathing constriction. Salt Supply was born in 2015, inspired by a shooting incident in the neighborhood where the founders Adam Kennedy and his wife live. They were alarmed by the threatening incident and decided to look for options to protect themselves. They found two: traditional firearm and pepper spray or Taser. Firearms require training and licensing and have the capability to take a life which made the couple doubtful of this option. Pepper sprays and Tasers, however, have a limited range which is ineffective in a shooting scenario. What they need is a combination of these so they consulted Andy McIntosh who is the head of the engineering department at Honeywell. The team came up with the SALT prototype which closely resembles a paintball gun rather than the usual handgun. It uses compressed air to fire each round instead of gunpowder, removing the sound, recoil, and deadliness of the weapon. The gun is powered by a 12g CO2 cartridge, enough to let you shoot up to 21 bullets. When triggered, SALT fires a bullet at a speed of 97m/s, producing a 50mph impact and inflicting agonizing pain to the target. SALT’s bullets have an effective trajectory range of over 150ft – 15x more than the range of pepper sprays and Tasers. Upon contact, the bullet explodes, releasing a toxic cloud 5ft around the target. Even if you’re not an experienced shooter, the defense cloud will surely catch the assailant in range. The chemical cloud dissipates within 3-5 minutes. The bullets are safe and non-fatal and have received approval from the US Military and the Federal Bureau of Prisons. Each bullet contains the same mixture used by the police, military, and prison guards in immobilizing and controlling security threats. The effects are definitely painful but far from being lethal. It can last for 15-30 minutes depending on the dosage and length of exposure. This non-lethal solution is perfect for home protection. The chemical rounds can be stored up to 5 years without losing their effectiveness. The SALT kit contains the SALT gun, a hard case, a 7-round magazine, 10 practice rounds, 10 live rounds, and a user manual to guide you in its proper use together with the safety precautions to be considered. The kit is priced at $350 and usually ships within 24 hours.